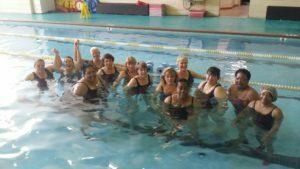 This class uses the resistance of water for strengthening and cardiovascular exercise. Great for post-rehab, maternity, beginners or advanced, young or mature students. Grab a swimsuit and jump in! No swimming is required. This class uses the resistance of water for strengthening and cardiovascular exercise for a total body workout. We will use water dumbbells and noodles as needed. This is an upbeat class - Great for all, from beginner to advanced athletes! This water aerobics class follows the Tabata format of 20/10 x 8 for 4 x's (20 seconds fast/ 10 seconds of rest x 8 = 4 minutes - repeated 4 times for a total of 20 minutes) x 2. Tab-Aqua is a great, quick paced water workout that is suitable for all - beginners to advanced athletes.